44 million marks budgedted. The German Navy dept. argued that Cruiser "G" as she was code-named should have 30 cm guns, but Tirpitz won the argument and increased the number of turrets. Scuttled at Scapa Flow. Salvaged 1927 and scrapped in Rosyth between 1927-1929. All action times are CETFourth ship in the line, behind the Seydlitz and ahead of the con der Tann.At 16:51, two minutes after opening fire, Motlke hit Tiger twice but both without major damage, Then followed 4 shells, two of which kocked out both the midships and aft turrets. Around 17:05 Moltke fired torpedoes from a range of between 10,400 and 11,500 yards at the Queen Mary causing the line to fall into disarray. The German line now came into range of the Queen Elizabths who concentrated fire on von der Tann and Moltke, the last two ships of the line. At 17:16 one 15" hit and a coal bunker and set off a fire in a casemate destroying the ammunition hoists. Lion hit back but at the same time one of Lutzow&apos;s 30 cm shells penetrated Lion&apos;s Q turret starting a magzine fire. The magazines were flooded but 30 minutes later a fire ignited causing a huge pillar of flame. At 17:03 Indefatgable was succesfully hit by on der Tann. After she had exploded, Beatt&apos;y lin turned away but in doing so Seydlitz and Derfflinger concentrated on Queen Mary which exploded at 17:26. 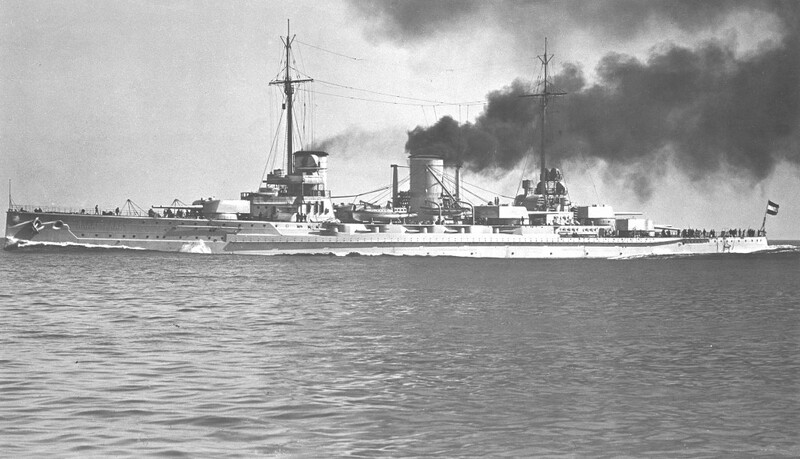 While Motlke and von der Tann were taking fire from the 5th BS, Derfflinger and Seydlitz comcentrated fire on the Queen Mary. Soon after 19:30 the Grand Fleet was encountered. Scheer could not get away without sacrificing his slower pre-dreadnoughts (He had thought about retiring early from battle but the encounter with the Grand Fleet now made this impossible). His 180 degree turn to starboard putting them on his disengaged side.At 21:00 Beatty moved his ships westward to follow the sound of gunfire, sighting them at 21:09. Moving to 8,500 yards they opened fire. It was a difficult moment as Hipper was just trying to transfer from the G.39 (it took till 22:15 till he transfered to the Motlke).. Nevertheless German fire was strong: at 21:32 both Lion and Princess Royal were hit. Once on Moltke, Hipper ordered his ships to close with the main battle fleet. Derfflinger and von der Tann were badly damaged and could only make 18 kts and could not keep up with either Seydlitz or Motlke. The latter closed too near to the line, pushing Stettin out of line, The chain reaction led to Frauenlob, Stuttart and Munich to turn to port to avoid a collision. On doing so they ran into the 2nd LCS and fire was opened at 800 yards. But the encounter gave Southampton a chance to launch a torpedo which mortally damaged the FrauenlobIn the confusion, Seydlitz could not keep up with Moltke&apos;s 22 kts and the two separated. At 23.55 and at 00:20 Karpf tried unsuccesfully to get through the British line. He did so at 01:00 when he had managed to get ahead of the Grand Fleet. At 03:55 Hipper reported to Scheer: "I Acouting Group was therefore no longer of any value for a serious engagement, and was consequently directed to return to harbour by the commander in chief, while he himself determined to await developments off Horns Reef with his battle fleet" (Wiki 2324). Molkte had hit Lion 13 times and had been hit herself 4 times by 15" shell. 3 Parsons steam turbines driving four shafts. Rated at 52,000 shp.